apple recipes. apple recipes Indian. Apples are juicy, fleshy fruits that are available all year round and all throughout the world! They are found in red and green varieties that also differ in taste. The green apples are more tart and sour in taste than the red ones, which are sweeter but in general, the fruit is of a sweet variety. It has a roundish shape, tapering at the bottom and is honestly one of the tastiest and easily available fruit there is. Apples can be had plain, like all fruits, or you can make fun recipes with them for breakfast or even snacks. Such a sweet fruit works great in Indian desserts. The freshness of the apples combined with the nuttiness of walnuts make for a delicious Apple Halwa to serve for Diwali or any other occasion! You don’t even need to peel the apples here, just use it with the skin! Jalebis are beloved by all but have you ever tried Apple Jalebis? These jalebis are made by dipping apple rings into a batter, deep frying them and soaking in a sugar syrup to get a rich, saffron, sweet sticky goodness. A perfect balance of modern concepts and traditions, Quick Apple Sandesh is a convenient recipe made with paneer and grated apples, soothing to the palate and perfect as a quick dessert. Speaking of easy recipes, Microwave Apple Kheer is the one to make. From cooking the apples to thickening the milk, everything is done in the microwave and in much lesser time! It is said that apple makes for a perfect breakfast option as it is nutritious and filling! A healthy mix of grains and oats, combined with apple, enhanced with cinnamon powder, makes Apple Porridge the perfect breakfast option! A sumptuous sandwich with Creamy Alfalfa Sprouts and Apple on Toast is such a delight when perked up with mustard powder and black pepper. Turning apples into tiny cups makes them so much more interesting to eat! Fill these cups up with different types of other fruits and you have yourself Apple cups with Fresh Fruits. Pancakes in any flavor are acceptable to us, especially when they are so sweet, tiny and delectable. Apple Honey Pancakes are flavored with condensed milk as well, to give them a smooth feel which makes them awesome breakfast options. If you are not up with eating apples, you can drink them! Start your day with an Apple Date Smoothie to get you energized. "An Apple a day keeps the doctor away" is a correct saying after all. It is fibrous, filled with antioxidants, low in sodium and helps in relieving constipation and diarrhea! Whether put in juices or in salads, it is healthy eaten either way. But the most important thing to remember here is to not peel the skin of the apple as the skin contains most of the fiber. Baby Spinach and Apple Salad in a Curd Lemon dressing might sound a bit odd, but when you taste it you'll realize how well the flavors mend together. Apples can even mixed with other greens like a Kale salad and Lettuce Salad to make flavorful salads which are as tasty as they are healthy. Hot Apple Cider is effective in relieving symptoms of cold and flu. Juices are the most effective way of making people eat the fruits and vegetables they don’t want to. When you add apples to these juices, it adds a hint of sweetness that makes all juices taste better naturally. Carrot, Beet and Apple juice and Muskmelon, Apple Green grapes Juice are two such examples of healthy juices. If not with fruits, you can even add apples in a spinach juice to make it more flavorful. Iron laden pancakes made with jowar flour are slightly sweetened with apples and honey and are great for expecting mothers. Mini Jowar Apple and Walnut Pancakes are such a winner that everyone will love them, not only pregnant women! Where there is an apple, there will also be a ton of dessert recipes that follow! Just like any other fruit, it is used in an array of desserts all around the world. Crunchy Apple Custard is sweetened with the flavor enhancing brown sugar with bits of apples in it to provide that delightful crunch. Stuffed Apple Crepes Topped with Orange Sauce is also a delicious way to enjoy apples. The contrast of oranges and apples works well together to flavor the milder crepes. The French really know how to use their fresh produce very well. French Apple Tart takes a little time, and beautiful artistry, but it is definitely worth it. The flavors of cinnamon and brown sugar do not dominate the apple and serve it with a side of Apple Cinnamon Ice Cream and you have the perfect party dessert on your hand! 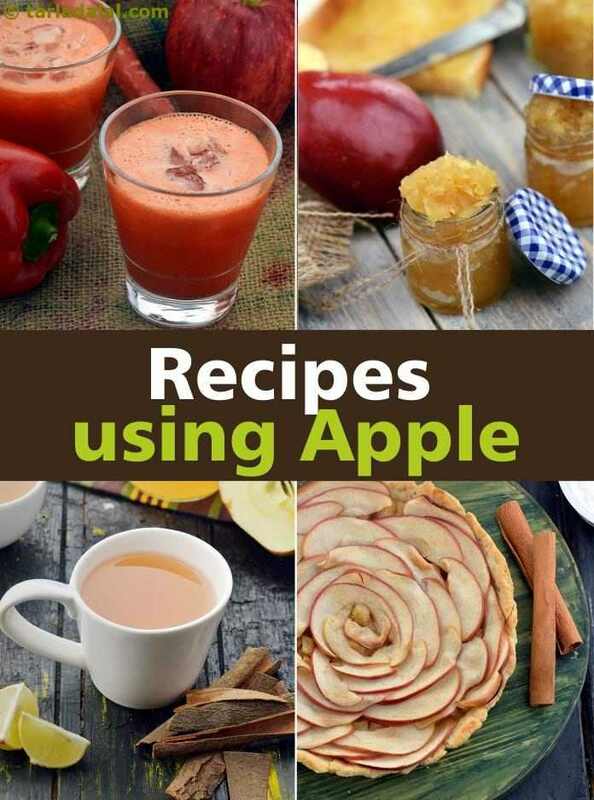 Enjoy our apple recipes. apple Indian recipes given below.